Includes more than 40 visual effects for images. Is there a better alternative to ImageLobe? Is ImageLobe really the best app in Image Editing category? Will ImageLobe work good on macOS 10.13.4? ImageLobe allows you to easily apply powerful visual effects to your images. It uses new Quartz Composition effects that are built into OS X. Over 40 sophisticated visual effects available. Simply drag an image onto the app, select an effect, and then drag the image back out to save it. It's automatically expandable: when Apple or any 3rd party developers add new Quartz Composition image effects to your system, ImageLobe will detect them and make them available. Note: ImageLobe 5.6 is compatible with OS X 10.7 or later. An older version, compatible with OS X 10.6 (32-bit), is available as a part of the same download. Updated a few of the image-effects algorithms. Choose from numerous effects, including City Lights, Color Pencil, Comic Book, Crystallize, Glow, Light Tunnel, Neon, Posterize, Thermal Camera, X-Ray and many more. 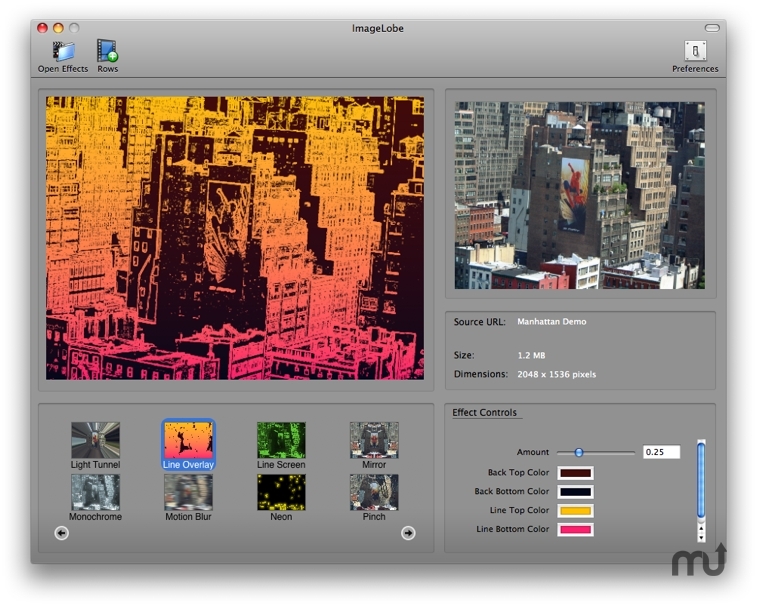 All of ImageLobe's features are available in demo mode.